TSPSC PGT Results 2017 for Telugu, Urdu, English and Hindi has been released by the Telangana State Public Service Commission (TSPSC) on its official website - tspsc.gov.in. 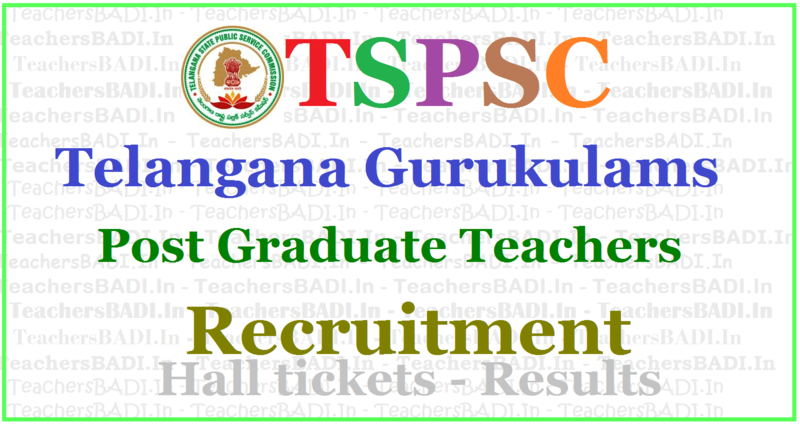 TSPSC PGT Exam results for Post Graduate Teachers to apply for teachers’ posts in various residential educational institutions societies and Gurukul Schools in the state of Telangana. As per the result, 363 candidates have been provisionally selected and 45 vacancies have been left unfilled due to non-availability of 17 candidates from VH category and 28 in Urdu subject. The result shows the Hall Ticket Number along with the Selected Society and Selected Zone for the final candidates. How to Check TSPSC PGT Results 2017? Telangana State Public Service Commission (TSPSC) has restated to the selected candidates who have been picked for Certificate Verification to relinquish their posts so that TSPSC can pass on the opportunity to the next deserving candidate. “the selected candidates who are picked up for TGT Certificate Verification were requested to relinquish their claim for TGT posts so as to enable the Commission to fill up the relinquished vacancies with next meritorious candidates in TGT duly giving opportunity to other deserving candidates,” read the statement. Candidates who wish to surrender their selection can do so from today onwards on the official website, “The relinquishment form is provided with this Selection Notification vide web link which will be available from 21/12/2017 on website www.tspsc.gov.in. If it comes to the notice of the Commission later that any candidate furnished false information or the selection is not in order due to any act of omission or Commission of any candidate then his/her provisional selection is liable to be cancelled at any stage and they will forfeit all consequential benefits including that of selection,” stated TSPSC. ii) Bachelor of Education (B.Ed) or B.A.B.Ed / B.Sc.B.Ed from any institution recognized by NCTE with the subject concerned as a Methodology subject. i. PGT (English): M.A. English (OR) equivalent Degree from an institution recognized by the UGC. ii .PGT (Telugu): M.A. Telugu (OR) equivalent Degree from an institution recognized by the UGC. iii PGT (Maths): M.Sc., Mathematics (OR) equivalent Degree from an institution recognized by the UGC. The candidate should have studied the subject Mathematics at Graduation. iv PGT (Physical Sciences): M.Sc., in Physics / Chemistry (Inorganic /Organic /Physical Chemistry ) or Equivalent Degree from an institution recognized by the UGC and the candidate should have studied Physics and Chemistry as main subjects at Graduation level. v PGT (Biological Sciences): M.Sc., Botany or Zoology (OR) equivalent Degree from an institution recognized by the UGC and the candidate should have studied Botany (OR) Zoology as main subjects at Graduation level. vi PGT (Social Studies): M.A. (OR) equivalent qualification in History / Political Science / Geography /Economics/ Sociology from an institution recognized by the UGC and the candidate should have studied any Two of the above subjects in Graduation level. vii PGT (Hindi): M.A. Hindi (OR) equivalent Qualification from an institution recognized by the UGC. ix PGT (Sanskrit): M.A. Sanskrit (OR) equivalent qualification from an institution recognized by the UGC B. A first or Second Class B.Ed (OR) equivalent Degree from an institution recognized by the UGC with methodology in the concerned subject with not less than 50% of marks NOTE:- Subject wise vacancy position is available at ANNEXURE-I and candidates may apply as per the vacancy position in their concerned subject. AGE: Minimum 18 years & Maximum 44* years. The age is reckoned as on 01/07/2017 (Rule- 12(1)(a)(v) of State and Subordinate Service Rules). *As per G.O. Ms. No. 329, GA(Ser.A) Dept., Dt. 27/07/2015 read with G.O. Ms. No. 264, GA(Ser.A) Dept.,Dated: 26-07-2016, the upper age limit is raised up to 10 years. THE FINAL SECLECTION OF THE POST WILL BE BASED ON MARKS SECURED IN THE MAIN EXAMINATION EITHER ONLINE OR OMR BASED. 1. The applicants will be subjected to a “Preliminary (Screening Test)” of Objective Type for the purpose of short listing the number of candidates to be admitted to the main examination (Objective Type) and the marks secured by the candidates in the preliminary (Screening Test) will not be counted for the purpose of final selection in terms of G.O.Ms.229, GA(Ser.A) Dept., dated 30-06-2016 read with G.O.Ms.No.316, GA(Ser.A) Dept., dated 17-08-2016. 3. Those candidates who qualify in the Main Examination (Objective Type) in order of merit will be called for in 1:2 ratio for verification of Certificates, Community and Category wise for the vacancies available. The minimum qualifying marks for Selection are OCs 40%, BCs 35% SCs, STs and PHs 30%. The minimum qualifying marks are relaxable in the case of SC/ST/BC/PH at the discretion of the Commission. The selection to the post will be based on marks secured in the main examination. to be qualified and eligible, subject to fulfilling the selection criterion. Hall Tickets can be downloaded 07 days before commencement of Examination from the TSPSC Web portal. 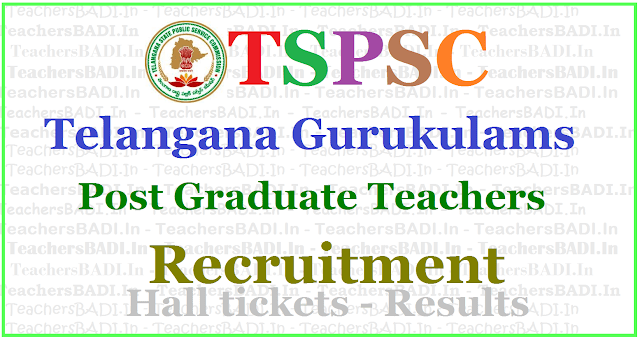 TSPSC Gurukulam PGTs Recruitment Hall tickets are available on tspsc web portal and TSPSC Gurukulam PGTs Recruitment Exam date is 31-05-2017. Web note: Hall ticket Download for Combined & common Preliminary Examination for the Posts of Post Graduate Teacher, Trained Graduate Teacher and Physical Director Notification No.s 13/2017, 14/2017 and 15/2017. Web note:: Hall Ticket Download for Notification No.s 13/2017 & 14/2017 Combined & Common Preliminary Examination for the Posts of Post Graduate Teacher and Trained Graduate Teacher(Languages). 1. Screening Test for PD and optional subjects of PGT and TGT posts and English language is scheduled on 31/05/2017. 2. A separate Screening Test for languages posts i.e., TGT, PGT posts(Telugu, Hindi, Urdu and Sanskrit) will be held on 14/06/2017. It is hereby informed to the candidates that the postponed Exams for various posts in various Residential Educational Institutions Societies, will be res-scheduled and announced shortly, since the Hon'ble High Court vacated the stay orders on above recruitments. Sir please answer, tgt biology main exam questions are come from given syllabus or out of syllabus.